Community engagement sits at the heart of planning and it is important that engagement practice be continually assessed to ensure that we really do achieve leading-practice outcomes. Wendy Sarkissian reflects on her experience in community engagement in planning to provide some suggestions for engagement by UrbanGrowth NSW and Planning and Environment NSW more broadly. I was encouraged by the article, “UrbanGrowth NSW: Participation a key to city transformation” by Abbi Jeffs on behalf of UrbanGrowth NSW. It’s heartening to see a reflective practitioner working in government setting out the parameters and it’s a valuable contribution. To know that UrbanGrowth is following IAP2 and National Centre for Dialogue and Deliberation’s guidance is also encouraging. What concerned me was the lack of reference to a corporate policy, a government policy with guidelines—or even an acknowledgement of the corporate memory of the organisation. I hope I have this wrong, but initially it seemed to me that UrbanGrowth was starting its policy all over again and articulating it in response to a request from this journal, rather than reflecting its corporate learnings and a high-level policy framework. In living memory, UrbanGrowth NSW was Landcom—they had an engagement policy and guidelines. The document is still on the UrbanGrowth website in the form of the Stakeholder Consultation Workbook. For practitioners like me, that Workbook provided direction and reassurance and it is definitely a good starting point. Updating that outdated document is not enough, however. We need more from UrbanGrowth NSW and the Department of Planning and we need it now. Here are some preliminary ideas on where I believe they need to start. I believe that the NSW Government and UrbanGrowth NSW need a robust policy with organisational endorsement and high-level political support—preferably one that is worked out with genuine involvement of community representatives. It needs to go well beyond the somewhat stale directives of the IAP2 Spectrum, which is now widely regarded as out-of-date. I suggest that they have a look at the Capire Triangle developed by skilled practitioner, Amy Hubbard, from Capire in Melbourne (see diagram). Critically, what is innovative (and appropriate) about the Triangle is the emphasis on relationships. The UrbanGrowth article does not mention relationships. That seems to be missing, in my view. Guiding engagement principles that go with the policy must also be developed through a consultative process. These principles will help to guide the UrbanGrowth NSW and State Government staff and give confidence to them and to developers and community members. They can also provide the basis for an evaluation framework. A co-production model used in the preparation of the guiding principles (which could be taken down to the level of specific guidelines) would allow for shared ownership of the principles. There are many models available that could be tied to evaluating the outputs that would result from implementing the above suggestions. I’m encouraged by UrbanGrowth’s attempts at evaluation and the fact that they publish their results. If evaluation processes were always formative and not solely summative, UrbanGrowth NSW could tweak its processes as they go without being seen to have ‘failed’. We are all aware that urban renewal is very tricky and there inevitably will be failures along the way. If UrbanGrowth NSW could continue to open itself to formative evaluation processes, everyone would benefit and the capacity of the community would be strengthened, as well as the relationship-building opportunities for informed decision-making. I could imagine UrbanGrowth NSW representatives saying, ‘We are just tweaking things, according to the evaluation framework’s information.’ Moreover, in the community sector, people would perhaps be a bit more understanding. This approach would involve using pilot-tested evaluation questionnaires at every process/workshop/event, so that all participants could openly track the effectiveness of the Government’s initiatives. This needs to be more than reporting that a certain percentage were happy with a session – it needs to provide transparency on the range of people’s responses and to have opportunities for community members to help UrbanGrowth interpret findings. I want to see successful community renewal in NSW, having seen both good and bad examples in my career. I fear that UrbanGrowth NSW will find that if they keep operating without a policy, principles and guidelines, or an explicit evaluation framework (for all projects and all stages) —they will come unstuck. To me, it’s simple governance: you have to have something by which you measure your effectiveness. And just getting ‘approvals’ is not the only (or best) measure. 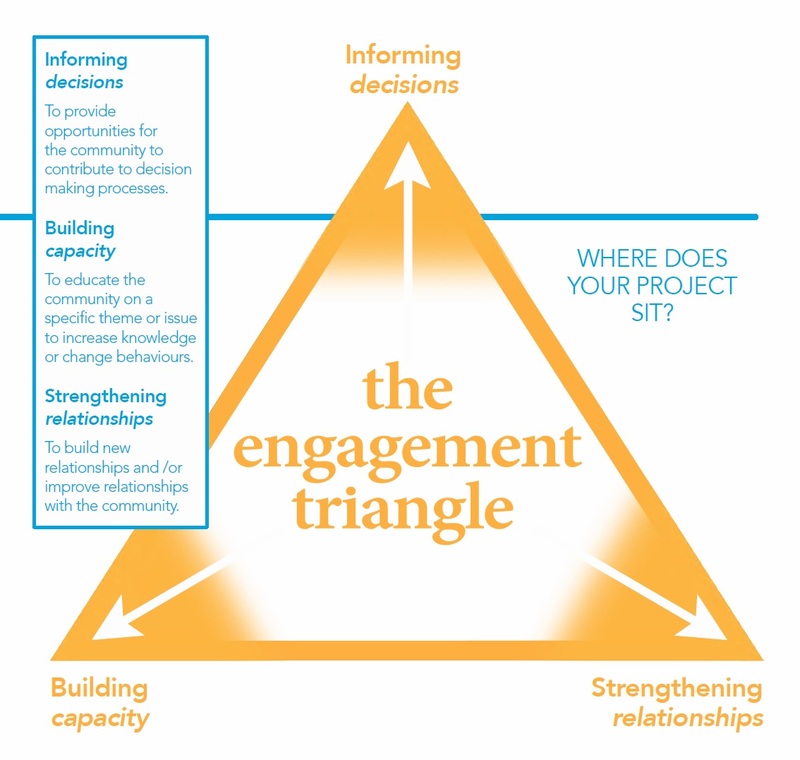 The Engagement Triangle was created to assist clients of Capire Consulting Group to identify the desired outcomes for their engagement and ensure the maximum benefit for all projects and communities. The Engagement Triangle can also be used to map engagement techniques and stakeholder groups. Let’s build on years of engagement work by the Government and Landcom—some of which was quite good, resuscitate those old guidelines, update them and make sure that they have high-level support. Put them out for review and consultation—with a view to further tailoring and updating. This approach would help both practitioners working within government, as well as those working for government as consultants. And developers, of course. In the case of UrbanGrowth NSW, we could start with a thorough review of the Landcom stakeholder consultation document in the light of previous Landcom experience, current UrbanGrowth NSW work and leading-practice community engagement—with a view to keeping the parts that work and are still relevant. This is a project that needs an adequate budget but it would not be that difficult to do. To explain the complexities of the highly contested realms of urban renewal, we need a capacity-strengthening model that pays attention to community education. We wrote about that at length in chapter 5 of Kitchen Table Sustainability in 2009 and it seems highly relevant here. I’m always delighted to see how communities can learn and adapt when they are supported. In my practice, I was impressed by the example of a Perth developer negotiating the rate of return and the developer’s profit margins with community members in a large capacity-strengthening community workshop. This is complex work but it yields great results. To do it, however, you need to respect communities and their ways of learning and strengthening their own capacities. This would involve co-production, co-planning and respecting the wisdom of the communities. As an example: where the bars and the student housing are to be co-located near Central Park, I wonder, as an occasional academic, longstanding student and occasional insomniac, how co-location will work if students are supposed to study and then sleep above bars and a late-night culture in a public space. Within the community engagement space (as opposed to the government space), there has been a lot of discussion about potential conflicts and problems with the planning and management of this site. Are those discussions reaching those in power? I hope so because I worry for the vulnerable, sleepless students. I’d like to see more discussions, initiated and supported in the community spaces of engagement. 4. Genuine representativeness: Here we need authentic processes, not just randomly selected panels, which make it looks as though planning is a rational, detached, objective, technical process— when it clearly is not. I’m all for citizens’ juries but I fear the supremacy of exclusionary professionalism. We need hands-on models that get people (including government representatives and their consultants) broadly involved in planning contexts, ‘getting down and dirty’ with local people at the local scale. Listening to local stories and respecting ‘fine-grain’ perspectives. The UrbanGrowth participation article set out five best-practice principles. While they are good principles, they are not complete and they certainly do not constitute a ‘policy’. I believe we need something a bit more robust and up-to-date. I have looked at the principles in the article, made some comments and added a few guiding principles of my own that I think need to be considered. Collaborative: The principle talks about working with Council but what about working with communities? And activists? And organisations committed to social and environmental change? This is the ‘A’ of the EATING (Education, Action, Trust, Inclusion, Nourishment and Governance) model in Kitchen Table Sustainability. It’s worth a look to see how collaboration and inclusion can work together. It’s particularly important to explore the ways in which activists and advocates can be included—and respected—in these processes. I expect that UrbanGrowth and others would find that many consultants, for example, are keen advocates, eager to improve and enrich engagement processes. Purposeful: Really, at the risk of sounding tautological, all our work must be that or we are not in the business of planning or development. This objective could be rewritten as community capacity strengthening. Proactive: Again, this is about capacity strengthening. Accountable: Here I’d say that UrbanGrowth NSW needs to cast a much wider net. I’m eager to review their engagement strategy for migrant communities, children and young people. How will they reach beyond identified ‘stakeholders’ in the wider community of unaffiliated and hard-to-reach people? In my view, the emphasis on stakeholders is very old-hat. Interested people may not be affiliated but they still have an interest (as I have an interest in Kakadu and uranium mining there or in coal seam gas mining forty kilometres from my home). Inclusive: Here I’d be looking to see their engagement processes for hard-to-reach people. Normally we think of children, young people, CALD communities and public housing tenants, but there are many others that don’t easily engage that need to be bought in to the discussions if it is to be broad-based. If community recognition of UrbanGrowth NSW and its project is low in a community, I’d wager that it’s an indication of a lack of engagement. New strategies need to be developed to target those not engaged. Capacity strengthening: This principle could have a community education component and involve more conversations about the dollars. We only have to look at the tragic Bonnyrigg PPP community renewal example where the community was locked out of financial discussions that resulted in disaster for private owners, public/social tenants and private tenants alike when the private partner went bankrupt. That tragic process broke many hearts and probably resulted in the early deaths of some heartbroken elderly residents. Conversations with communities need to include budgets, timeframes, deliverables, assessment criteria and resourcing. After many years of working with communities all over Australia, I am convinced that ordinary folk can wrap their minds around spreadsheets. However, to reiterate a warning: care must be taken to avoid exclusionary professionalism in every instance. Relationship building: It needs to be a principle in its own right and not merely a ‘result’ of other principles. It appears that this principle is totally missing in UrbanGrowth’s article. Relationship building is one of the hallmarks of the Capire Triangle. Leading practice: I propose that UrbanGrowth NSW consider moving beyond the attractive, evocative (and somewhat seductive) language of Deliberative Democracy to explore the potential of other hands-on models that really work in planning contexts: models that involve a visceral approach to engagement—as mentioned earlier, more ‘getting down and dirty’ with local people at the local scale. There are some really innovative and leading-practice engagement processes happening in urban renewal around the world (see Looking elsewhere for guidance for a couple of ideas). There are such brilliant examples nationally and internationally of leading-practice community engagement. Common Ground: Identifying and building common ground based on a shared understanding of problems, values, vision and potential for the future. Values: Seeing and realizing the potential of cooperation and collaboration, building hope and efficacy with small short-term successes and moving towards larger, longer-term efforts. Inclusivity: Creating a safe, secure and inclusive environment for participation in planning, implementation and evaluation based on flexibility, respect, honesty and openness. Leadership: Building leadership and community initiative to maintain growth and momentum. Collaboration: Normalizing collaborative practices among community leaders and dealing with differences constructively and with compassion. Capacity: Sharing practical tools and building relational networks that increase the capacity of organizations and individuals to achieve their individual and collectives’ goals. Enrichment: Creating an environment for cultural and spiritual enrichment and social support and fulfilment. Synergy: Creating discursive and kinaesthetic space for creativity, innovation and synergy. Social Learning: Building a learning community to continually draw lessons from the work through evaluation and self-reflection. Adaptive Problem-solving: Constructively working through problems and differences together, and adapting strategies to changing conditions (Umemoto et al., 2015). UrbanGrowth NSW could make a start by emulating the Hawaiians. I’d be happy to make the introductions – the contact is: Karen Umemoto, Ph.D., University of Hawai‘i, Department of Urban and Regional Planning, Saunders Hall, 2424 Maile Way, Room 107, Honolulu, HI 96822 USA. They could also consider refining and tailoring robust models, such as the Corridor Development Initiative in Minnesota with the award-winning Minnesota Block Exercise (developed by Harvard-based Australian planning academic, Dr Ann Forsyth) and using the Capire community engagement Triangle. We would also benefit from UrbanGrowth NSW’s use of sustainability indicators in engagement processes, as well as the use of genuine community visioning processes, based on evidence-based research about what works and what doesn’t work in community visioning in planning contexts – (see: http://www.sarkissian.com.au/publications/earthscan-community-engagement-books-by-wendy-sarkissian-phd/creative-community-planning/community-visioning-and-heartstorming). Maybe taking a leaf out of the book of the international symposium for the Bays Precinct, there could be a bringing together of some of these experienced practitioners. In such a context, Government and renewal bodies like UrbanGrowth NSW could explore leading-practice community engagement approaches to urban renewal and incorporate their learnings into NSW engagement policies, principles, practice and evaluation frameworks. The 2013 Planning White Paper pointed out the deficiencies of community engagement in the NSW Planning System and proposed major changes in this area. While other changes in the White Paper have been progressed after the Bills failed to pass the NSW Upper House, we have yet to witness any move to address the community engagement deficiencies the White Paper identified. The issues raised in the UrbanGrowth NSW article and my comments here are crucial issues for the entire planning system—not only for UrbanGrowth. Hopefully, my comments will add to the discussion of these issues and to the much-needed policy, principles, practice and evaluation changes necessary to see leading-practice community engagement adopted in NSW planning. Wendy Sarkissian is an experienced engagement practitioner and Life Fellow of the Planning Institute of Australia (PIA). She is one of the authors of Kitchen Table Sustainability: Practical Recipes for Community Engagement with Sustainability (2009). Source: ‘Top Ten Ways to Foster Community Engagement in Planning’ unpublished article by Tai-An Miao, Karen Umemoto, Deanna Gonda and Earl S. Hishinuma (forthcoming 2015).